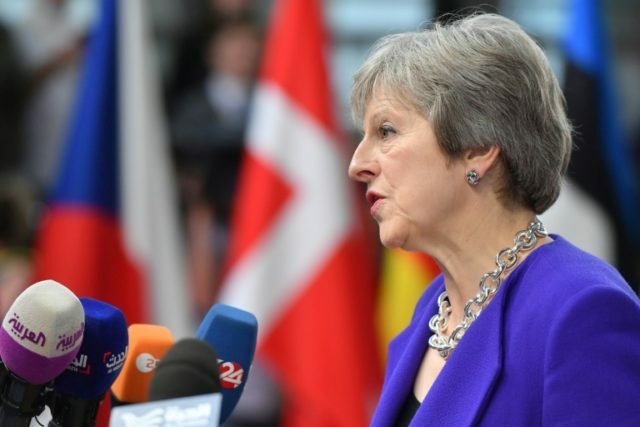 Brussels (AFP) – Prime Minister Theresa May confirmed Thursday that Britain would consider extending the transition period after Brexit for a few months if needed to agree a new trade deal with the EU. EU negotiator Michel Barnier raised the idea as a way of breaking the deadlock on how to keep Britain’s border with Ireland open after Brexit, the key issue holding up the divorce talks. Arriving for a second day of summit talks in Brussels, May noted that both sides remained at odds over a “backstop” plan to avoid frontier checks in Ireland if and until a new trade deal could be signed. “A further idea that has emerged — and it is an idea at this stage — is to create an option to extend the implementation period for a matter of months,” she said. The top-selling The Sun tabloid warned it was “an outrageous non-starter”. “Unless she can give a date when we will leave the EU and ALL its major institutions she cannot claim to have fulfilled the referendum vote” in 2016 for Brexit, it said in an editorial.